I love this still and pensive woman who holds a balance in her hands in perfect equilibrium. Behind her, partly covered, we see a painting of the Last Judgment, entirely rendered in accordance with tradition based on Matthew 25:31-46. It is entirely remarkable that this woman takes in the place on the painting, where usually the Archangel Michael is situated as the executor of the judgment, often also with a pair of scales in his hand. Right above the woman’s head Christ sits enthroned. He seems to bless her and also us, the viewers. To me he does not look as an implacable judge, but rather as the Lord who promises us his loving presence, every day, until the end of the world (Matthew 28:20). This young woman is focused full of concentration on the balance. She radiates an inner peace and balance. When you look closely, you will see that the disks of the scales are empty. Therefore she cannot be labelled – as some do – as a woman bent on jewels and richness or as a personification of vanity. The scales rather show that she is in control of her life and that she is aware of her own responsibility. She thus does not exemplify humanity living in fear of the future and the Last Judgment. Relieved of this worry, she can focus on the present. She is pregnant and the child growing within her symbolises a future that no-one can take away from her. She will receive life just as she will receive her child. The mirror on the wall opposite the woman possibly symbolizes her self-knowledge. Because of this insight into herself she can live a responsible life before her Lord, weigh her actions and respond in her own way to the commandment of love. She can comply with everything Matthew 25 talks about in connection with the coming judgment. She can open the door for whoever is hungry or thirsty, for the sick and the prisoner. A mature woman modestly and moderately taking responsibility for her life before God, that is the model the painting presents to us for our consideration. Quite a programme! Johannes Vermeer: Woman Holding a Balance, 1662-1664, National Gallery of Art, Washington, DC, USA. Johannes Vermeer (1632-1675) was a Dutch painter. He was born in Delft and stayed there all his life. Vermeer was buried in the Old Church (Oude Kerk) in Delft. His paintings are admired for their transparent colours, well thought-out composition and brilliant use of light. Little is known about his life. He married Catharina Bolenes in 1653 and converted at this occasion to the Catholic faith of his wife. In that same year he joined the Saint Luke painters guild. In 1662 and 1669 he was chosen to preside over the guild. 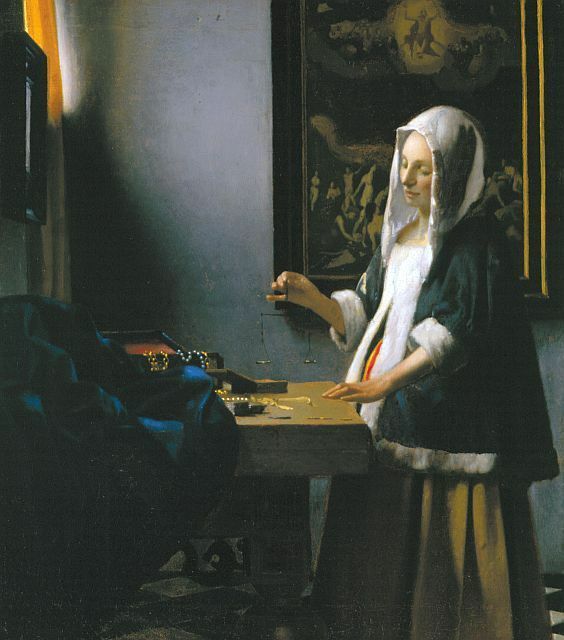 Vermeer earned a meagre income as an art dealer rather than through selling his own paintings. Sometimes he even had to pay his debts to local food stores with a painting. He died very poor. After his death he was soon forgotten. Vermeer was recognized only in the later 19th century as a great artist. Only 35 to 40 works are attributed to him. Vermeer painted mostly genre pieces and portraits. As an exception he left us also two city views. His works carry religious connotations that are frequently overlooked today. André Herren worked in a chemical laboratory before studying theology in Geneva and Göttingen. He has worked as a pastor with Mouvement d'Action Rurale (MAR) in Wanquetin in northeastern France for the Reformed Church of France as well as in and near Geneva, Switzerland. He has taught for the Protestant Church of Geneva at the Ecumenical Studio of Theology (Atelier Œcuménique de Théologie) for 30 years, while also serving as its co-director for 8 years.